We can provide up to $400 per child per calendar year (which is January to December) for each child in your family. We look at when the activity is taking place to determine which calendar year it falls under. Please note: It is not a guarantee that you will get $400 for your child because it depends on how much funding we have overall. Funding is on a first-come, first-serve basis. We fund sports, arts, music, camps, and other recreational activities. Beginning in 2019, we also fund life-skill development activities, such as CPR and first aid courses, babysitting courses, driver’s education, and tutoring. Click HERE for a full list of the activities we fund. Families with income (we look at Line 236 on your income tax) below the current Low Income Cut-Off (LICO) (see table below) can get full funding (up to $400 per child). Click HERE to see what documents you need to show us your family size and income. I don’t have the CCB-OBC Notice. What can I use? Note: The size of the document should be less than 8MB if you are uploading it on the computer or emailing it. If you are uploading, we ask you o black out your Social Insurance Number (SIN) number. For privacy reasons, we do not keep your personal documents on file. Please contact us if you don’t have any of these documents. 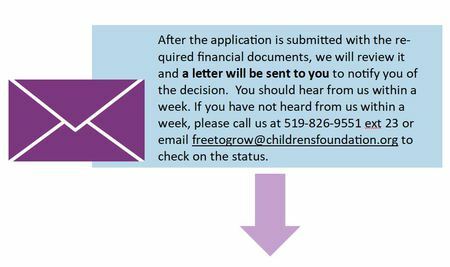 If you can’t upload your financial information, please email it to freetogrow@childrensfoundation.org, fax it to 519-766-4870, or mail/drop it off at our office at 87 Waterloo Avenue. Not usually. The sports, recreation, arts, and life-skill organizations in Guelph-Wellington may tell you about our program or help you apply, but they do not typically submit the application for you. You must apply directly to us, either through our online system or through a paper application. Your Username is your email address. Passwords can be re-set by clicking HERE. You will be asked for your email and you will receive an automated email with a link to re-set your password. Note: If you don’t see the email in your inbox right away, please check your Junk/Spam folder (or Promotions folder for Gmail accounts). Yes. You can see in the online system the status of your applications, whether they have been approved or are still waiting to be approved ("pending"). You can also see how much funding your child potentially has remaining for the year. Please note: available funding is not guaranteed as it depends on our overall availability of funds and is on a first-come, first-serve basis. It can take up to a week to hear back from us, based on how many applications we have. If you don’t hear back within one week, call or email us to check on your application. The application process usually takes one week to complete if you have given us everything we need. We recommend applying at least 2 weeks before the activity to give us enough time. You can apply for as many activities as you want. Each child has maximum funding of $400 per year. For each activity, you must apply again (either online or on paper). YES, you always need to apply again and give us the details of the new session/activity and costs. You may also need to give us more recent information about your income. We typically update once a year with the new Canada Child Benefit Notice. You can apply but we cannot pay you back as we can only pay the organization that provides the activity. However, most organizations can refund you once they have received confirmation that we will be funding the activity, so you could ask them if they will do that in your case. Can I apply for funding after the activity has taken place? No, we cannot fund an activity that has already taken place in the past. The activity has to be upcoming. In some cases, if the activity has started but the session is still underway we may be able to fund it. No. Funds are not transferred from year to year or from child to child in a family. Even though each child has a potential maximum funding of $400, it doesn’t mean that you will always get $400 for each child. It depends on our overall available funding, and we do fund on a first-come, first-serve basis.